Cecile Pineda's blog : DISPLACEMENT, WHO ME? my soon-to-be-published book Three Tides: Writing at the Edge of Being is all about. All three sections deal with the pressures acting on people everywhere to leave home: leaving an unsustainable way of living (mine); leaving flooded New Orleans (Katrina); and destroying a culture and leaving ancestor graves yawning empty because a toxic waste disposal company lays claim to village land (Japan). Much closer to home, two crises crowd all other stories to the back pages (except for the selection circus), namely the global refugee crisis brought about by climate collapse and resulting military hostilities (the Middle East) and all European countries trying to close their doors to the flood of displaced people. It may bring the crisis more clearly into focus to know that one out of every 200children in the world is now on the run, vulnerable to drowning in the Mediterranean and Adriatic seas; vulnerable to being incarcerated in jails for months on end because refugee camps are already full to overflowing. 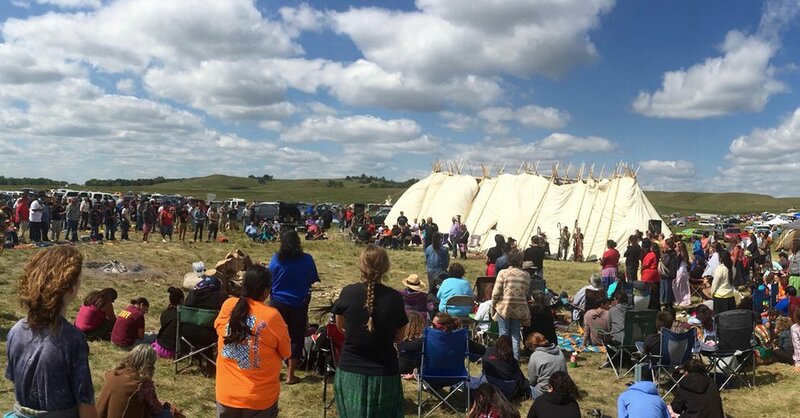 And in the Untied States, the Standing Rock Sioux have been joined by hundreds of other First Nations in a last stand to defend their sacred burial grounds and their drinking water from contamination by the proposed Dakota Pipeline. Our people have strived to protect Sacred Sites from the beginning of time. These places have been violated for centuries and have brought us to the predicament that we are in at the global level. Private security forces have turned the dogs on them, injuring one small child with horrifying facial wounds. A local judge has ruled against their case. 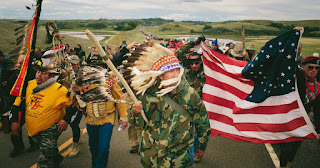 Governor Dalrymple has called out the national guard, and Jill Stein and her running mate, Ajamu Baraka have been threatened with arrest and warrants have been issued by the Moran County Sheriff’s Office for criminal trespass and vandalism in connection with their weekend trip to Standing Rock, to stand in solidarity with indigenous tribes resisting oil pipeline expansion through their sacred native burial grounds. It’s the first time in U.S. history that a presidential candidate and her running mate have been targeted for arrest. 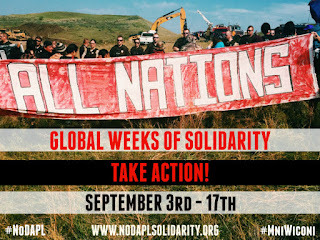 To quote Ajamu Baraka: What we need… in North Dakota [is] authentic decolonization. 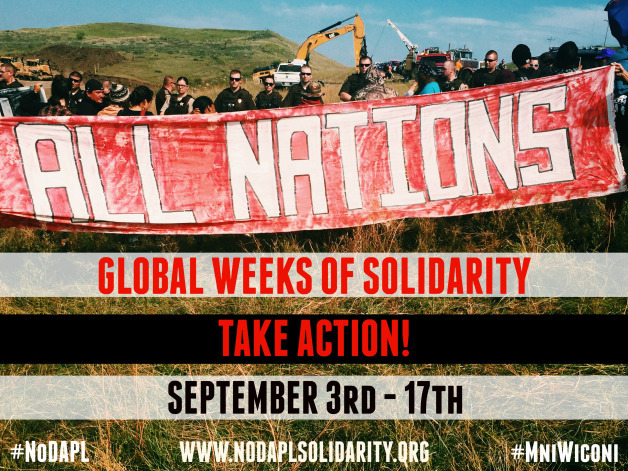 …Indigenous people don’t have full control over their sovereignty,…We are not going to have social justice as long as there’s continuity in this settler colonial project. …All of us are implicated. As of yesterday, September 10, the federal government stepped in to ask the pipeline company to “pause” action, to voluntarily halt construction temporarily within 20 miles of Lake Oahe, a sacred site of the local tribes. The snake doesn’t shed its scales easily. The government’s ploy acted to diffuse the threat of more violence by hired security forces and the national guard; and by initiating a delaying tactic, it attempted to disperse the massive resistance gathered together at Standing Rock. We have been displaced by the subprime mortgage crisis from our homes; we have been displaced from our universities by massive tuition hikes; we have been displaced from a reliable banking system now that U.S. law has determined that all monies on deposit are property of the bank, not depositors; we have been displaced from our jobs by offshoring and by trade agreements such as the TPP and the TISA, and by the disproportionate incarceration of people of color for minor drug offences, providing slave labor for the prison/corporate complex; we have been displaced from our streets by free speech zones; we have been displaced from our lives by the use of drones to target/assassinate even American citizens, and by militarized police who kill people of color with impunity and without judicial consequence; we have been displaced from our wombs by the anti-abortion agenda of the neocons; we have been displaced from our DNA by continued used of nuclear technology, not only in lands affected by the use of uranium tipped ordnance, but on our own soils by nuclear contamination from testing, and from accumulating nuclear waste. Know that you yourself are essential to this world. Understanding both the blessing and the burden of that. You yourself are desperately needed to save the soul of this world. Did you think you were put here for something less? In a Sacred Hoop of Life, there is no beginning and no ending. TWEET AND E-MAIL YOUR FRIENDS.